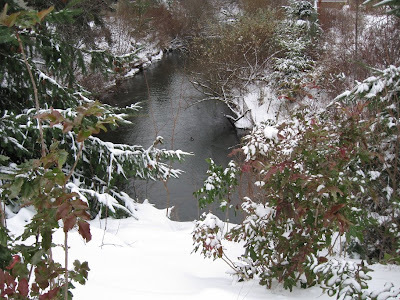 Whatcom Creek in the snow at Cornwall Ave. When school was canceled, my sister and I would cut out pictures of products from magazines. We each had a shoebox that we would drop our images into. When school was canceled, there was more time to add to these collections. Pictures would be snipped from magazine ads, articles and catalogs. We were furnishing estates. There would be estate cars, color TVs, radios, CB gear, fishing rods, couches, love seats, bathtubs, furnaces, camping equipment, auxiliary power units, sonic depth finders (for boats), you name it. We'd collect it. Drop it into the shoebox. Just imagine, if not being able to go to work means one's estate can grow faster. More time to cut from the endless stack of magazines. Those were warm memories that came back when I heard someone call a radio talk show describing how they spent the day that their kids couldn't attend school. They stayed home and had "quality" time. Opposite of our "on call 24/7" economy. Opposite of the idea for getting rid of summer vacation and having school 12 month per year. Let the estates be made out of paper. When school was out, we prospered.